Temperature sensors frequently react too late, because the medium to be monitored is no longer present. The rise in temperature is not passed on to the pick-up sensor. Pressure switches do not indicate low oil until there is a total shortage of oil and thus too late to protect the engine. The level sensor already indicates a critical filling level. The function of the sensor is based on the capacitive principle. It detects the change in capacitance that occurs when an electrode surrounded by air is immersed into a liquid medium. This change in capacitance at the electrode of the sensor excites an oscillator. This signal is processed by a microcontroller-based evaluation circuit which activates or deactivates an output stage. After the supply voltage is applied (e. g. ignition being switched on), the output is activated for the function control time, thus signalling operational readiness. If this signal does not appear, the sensor should be checked. The default function control time is 2 seconds. This self-monitoring makes it possible to check the level monitoring sensors from a central point for their operational readiness as well as for cable breaks. Especially in intricate, ramified systems, such as ships, checking conventional level switches may be very difficult. Other function control times are available upon request. To avoid indication errors when the swashing surface produces short fluctuations of the liquid level, the output signal is delayed with the standard fault indication delay time of seven seconds. Other indication delay times are available upon request. 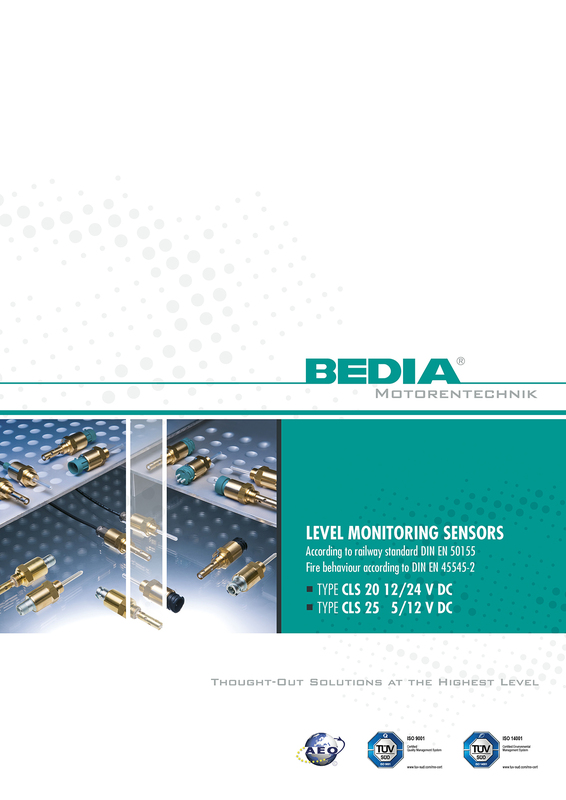 BEDIA level monitoring sensors may be installed in any position. For properly function the level sensors should be mounted in a calm area of the tank, otherwise a sensor with a fault indication delay should be used. This point is usually applicable for installation in gearboxes or for direct installation in engine oil pans during operation. In such cases, the measurement is only possible at engine shutdown. It is mandatory to mount the sensor with a minimum distance of 7 mm to the wall.